Maxxxboro is for vapers who enjoy classic tobacco with a fuller and deeper profile typical of the world famous cigarette brand. Rich, robust and bursting with delicious aromas, the main tobacco layer is underscored with just the right amount of honey-like sweetness and a pinch of spice. The net effect is an amazingly realistic and gratifying vape that is neither too dry, not too moist. The sophistication of Maxxxboro can be felt both ways: on the inhale, the flavor is an intense sensation with earthy tobacco notes. The trademark of all top-class liquids, the exhale is just as good as the inhale. On release, the vapor feels very similar to exhaling real cigarette smoke. Chunky white clouds, amazingly accurate flavor delivery and a flawless vape cycle - you simply can't go wrong with Maxxxboro. Sit back, relax and enjoy! 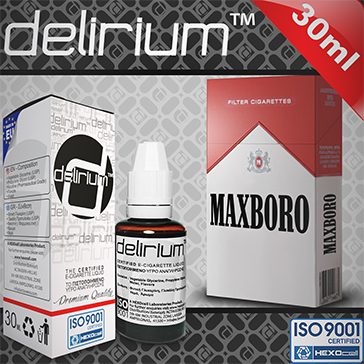 100% European Product delirium liquids are ISO 9001 certified and made in the EU using the most advanced methods and highest quality ingredients.